Austria/Germany/US, 2001, 84 minutes, Colour. Matt Le Blanc, Eddie Izzard, James Cosmo, Nicolette Krebitz, David Burkin, Edward Fox, Udo Keir, Karl Markovics, Pip Torrens. 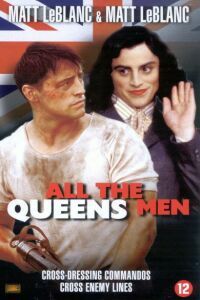 All the Queen’s Men is a very moderate comedy-drama about espionage in World War Two. It goes over some of the familiar ground of those espionage and war thrillers of the 1950s. However, this film has a different twist. A group of men are recruited to steal an Enigma machine from a factory outside Berlin. The difficulty is that it is staffed entirely by women. Matt Le Blanc plays (not quite convincingly but more intelligently than might have been expected from his role as Joey in Friends) an OSS crack espionage leader. The film opens with him escaping with an Enigma machine only to meet a British officer twit who insists on regulations that all non-army equipment should be destroyed and so destroys the machine. Le Blanc finds himself in a prison, playing rugby in the mud, so welcomes this opportunity for a new mission. However, they have to be trained to appear as women. This task falls to Eddie Izzard, able to indulge his alleged penchant for cross-dressing in this film. James Cosmo, not likely to deceive anyone as a woman in disguise, is also present as the leader of the mission. An Enigma expert, David Burkin, much more recognisable as a woman, completes the group. They meet their contact, a librarian, Nicolette Krebitz, in Berlin. They also meet Eddie Izzard’s former lover and former wife. The film also stars Edward Fox, embodying all that is pompous about British officers. The film was directed by Stefan Ruzowitzky. Audiences and critics would have been very surprised in the time that he made the film to know that within six years he would have won the Oscar for best foreign language film with The Counterfeiters (and the star of the film, Karl Markovics, appears here as the German officer). The film reflects a more permissive time in view of sexual orientation. However, Matt Le Blanc’s character seems to be at pains to uphold traditional views – with some macho edge. 1.Entertaining, interesting, comedy-drama? World War Two and espionage? 2.The Continental settings, Berlin and Germany? England? The atmosphere of World War Two? Action sequences? The period, costumes and décor? The musical score, the songs, the Marlene Dietrich tradition? The operatic excerpts, from Carmen? 3.The title, the theme, the cross-dressing, for the sake of espionage? Eddie Izzard and cross-dressing, his character, performance, songs, relationships, wife, lover? 4.The opening, World War Two, O’Rourke? and the pursuit, his derring-do, the tank, escape over the wire? The confrontation with the British officer, the idiotic conversation, the officer, the regulations, shooting the Enigma machine? O’Rourke? and his insults, finding himself playing rugby in the prison? 5.Aitken, the British official? Summoning O’Rourke? The explanation of the mission, the Enigma machine, the need for decoding the German messages? Johnno and his skills and languages? Meeting Tony, past army service, life in Berlin? Cross-dressing? Archie and his being big and burly, the secretary? Put in charge of the mission? Aitken and his explanations? 6.The collage of training, Tony helping them to be feminine? The contrast with O’ Rourke training them to be macho soldiers? Going into Germany, the parachuting? Assembling, donning the women’s clothes, the hitch-hike? Getting to the library, the wrong lead, the contact from Romy? The haupsturmfuehrer and his relationship with Romy? The pursuit, Romy feigning being attacked, helping them escape? Assembling at her house? 7.The poor information from England? O’ Rourke and the rooftop communicating with them? How to find the factory? The various theories? The fairy tales, the children and toys, Romy looking up documents in the library? 8.The characters, O’ Rourke and the very American OSS style? Archie and the Scot, his embarrassment in being disguised as a woman, unconvincing? The little girl following him around calling ‘Mother’? Johnno, adapting – and the difficulties with the toilet and the toilet seat, getting them into difficulties? Tony, his Berlin contacts, meeting Franz again, meeting Paloma? 9.The Germans, the touch of caricature? The haupsturmfuehrer? The general? His fascination with Gina, the sadomasochism, O’ Rourke and his raiding the safe? The general at the performance by Tony? 10.The various adventures in Germany, the dangers? The plan? Archie and the little girl, getting into the car? Tony and his performance in the club, taking Franz with him for the escape? Johnno and his being wounded, having to be carried? O’ Rourke, in the factory, with the women, with the guards, getting the machine, the escape? Getting to the plane? Going back, rescuing Archie who had given himself up and was being tortured, saving Romy? 11.The realisation of the plan, that they were merely decoys, that they were to be caught? The plane and the escape, the debriefing with Aitken? Archie attacking him? 12.The humorous touches, the serious touches, the 21st century perspective yet the 1950s style of film-making?